SINGAPORE - If there's one thing Singaporeans are used to by now, it should be the hot weather. But sometimes the heat is so blisteringly hot, it catches even tropical denizens by surprise. Last month (July), Singaporeans experienced a dry and warm month, with temperatures hitting as high as 35 deg C and levels of rainfall dipping below the norm. While there has been more rain in the first two weeks of August, the Meteorological Service Singapore still estimates slightly warmer maximum temperatures of around 34 deg C.
This is not just a local phenomenon either. With global temperatures rising, there has been news of lethal heatwaves sweeping over Europe andJapan. What are the dos and don'ts as the mercury climbs? The spotlight has been cast on heat injuries recently with the death of national serviceman Dave Lee and the subsequent drive to ramp up prevention and treatment measures in the Singapore Armed Forces. The Straits Times reported on Monday (Aug 13) that hospitals say heat-related injuries remain low, due to the lack of extreme temperature fluctuations in Singapore as compared to some other countries, and the availability and proximity of air-conditioned environments. But heat injuries are still a danger with any physical activity, especially when the weather is swelteringly hot. Symptoms of heat injuries include cramping, disorientation and confusion, and fatigue. Severe heat stroke can lead to organ damage or death. 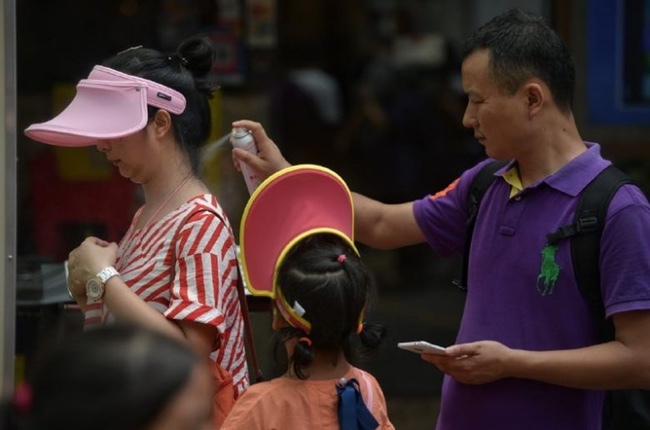 In an article in Chinese-language newspaper Lianhe Zaobao, Dr Malcolm Mahadevan of the National University Hospital said there are two situations in which people are susceptible to heat injuries. "The first type occurs mostly in younger and healthier individuals, due to excessive exercise for prolonged periods of time in a hot environment. The second occurs in older or weaker people, especially those encountering hot and humid weather after living mostly in temperate climates," the senior consultant and chief of the emergency medicine department said. How can one prevent heat injuries while exercising? The Health Promotion Board (HPB) has guidelines for physical activity that advise against exercising during the hottest part of the day, which is around 10.30am to 3.30pm, and scheduling physical activity for the early morning or late afternoon instead. Warm up slowly to give your body time to get used to warmer temperatures. You can substitute outdoor activities with indoor workouts, such as bowling, yoga and going to the gym, while waiting to see if the weather cools down. Wear lightweight and stretchable materials. A cotton T-shirt will trap heat and sweat. Also choose brighter, lighter colours, as dark colours absorb more heat. If you have to engage in physical activity while the weather is hot, consider wearing headgear such as a cap or a hat, and applying sunscreen to prevent sunburn. If you feel unwell, do not push too hard - take a rest as there is always time for a workout another day. Always have sufficient fluids before exercising. The HPB recommends consuming about 500ml of water before moderate exercise, or isotonic drink for intense exercise. Urine colour is a good indicator of hydration status. The darker the shade, the more dehydrated you are. Drink about 250ml of water every half an hour of exercise to enhance your body's fluid absorption during exercise. Drink at a comfortable pace so you do not get bloated. Thirst is not a good indicator of hydration; one can be severely dehydrated and yet not feel thirsty. Drink at least a litre of water after you complete the physical activity. Avoid alcohol and diuretics like coffee and tea to prevent dehydration. Those suffering from heat injuries often appear disoriented or delirious, and may complain about headaches and dizziness. They may also experience nausea. If the person's skin feels cold and clammy, it is likely he is suffering from heat exhaustion. If the person has a feverish temperature, reddish skin, muscle cramps and the absence of sweat, he could be suffering from heatstroke. In both cases, call immediately for medical attention. In the meantime, move the affected person into shade or a cooler environment. If the person is not conscious, do not try to give him food or water. You can also attempt to cool the person with immersion in cool water or by placing ice packs on his neck and groin areas. The heat is hard to bear even when you may not be exerting yourself physically. Some of the general rules apply, like drinking more water and staying out of the sun. Wear loose-fitting and permeable clothing to allow your skin to breathe and regulate heat more easily. Here are some other tips to ease life in the heat. Why do some people faint at large outdoor events such as concerts? Apart from the physical exertions of cheering and singing, and forgetting to drink water, concertgoers also experience the proximity of lots of other bodies. Bodies emit heat, and closely packed bodies also reduce ventilation. Crowds make it hard for one to make a quick escape or get fresh air if one starts feeling nauseous or dizzy - some of the first symptoms of heat injury. If you are feeling dizzy, your vision seems to lose focus, or you feel a throbbing headache, make your way quickly into the shade and seek medical help. You do not have to be outdoors and running about to get heatstroke. Stuffy environments trap heat, allowing it to build up, especially if there's no ventilation. This can be exacerbated by poor oxygenation in a confined space, making one feel nauseous. For example, after pulling up at the petrol kiosk, do not just sit in the vehicle as your friend makes payment or fills up the car. Get out of the car, stretch your legs, and get your blood and lungs moving. If you are in a room, and the air feels stale or warm, ventilate the room by opening a window, or turning on air-conditioning or a fan. The sun is not the only source of heat, and prolonged proximity to other sources can lead to heat injuries. Look out for innocuous and inconspicuous sources of heat. If you have children, keep an eye on them and limit their time in play areas like bouncy castles or ball pits. Bright, sandy beaches may look pretty, but they are also great absorbers and radiators of heat as you lie on the sand. Radiators and other machinery that line back alleys are another potential danger area. What is one thing Singaporeans know how to do better than coping with the heat? Eating, of course. When the sun beats down and we sweat rivers, we naturally crave chilled desserts and iced drinks. Bring on the grass jelly, ice cream, frozen yogurt and so forth. But do not forget cooling fruits like watermelon, pear and coconut. Hot weather is not just about desserts and cold drinks either. Cold food may sound unappetising, but a good gazpacho or a plate of simple soba noodles can be both refreshing and filling. Other cool recipes for a hot day include Vietnamese-inspired spring rolls or Thai glass noodle salad. But too much of a good thing can be bad. Here are some tips for eating not just well but also healthily during a spell of hot weather. With the oppressive weight of the sun beating down your back, the last thing you want is to weigh yourself down further with extravagant portions. Overeating can make your body feel even more sluggish and create more warmth. Instead, think light and small instead of big and hearty. Eat smaller meals throughout the day, and snack on cool but healthy snacks like sticks of carrot or celery dipped in hummus or yogurt. Drink plenty of fluids to keep your hydration levels high. Avoid soft drinks. They may quench your initial thirst, but the high amounts of sugar and caffeine in a bottle of soft drink will leave you feeling thirstier, and cause dehydration. Caffeine has a diuretic effect, so avoid coffee and tea as well. Sports drinks without caffeine can help replenish lost electrolytes and minerals such as sodium and potassium. Plain water, as always, is the best. Some drugs can increase the chances of heatstroke, as they affect the balance of salt and water in your body. These include blood pressure medication, antihistamines, antidepressants and sedatives. Seek advice from your doctor about your medication, especially if you feel nauseous, dizzy, light-headed or have a headache after taking them.